Recipe of Bhatura is much sought after by my readers. 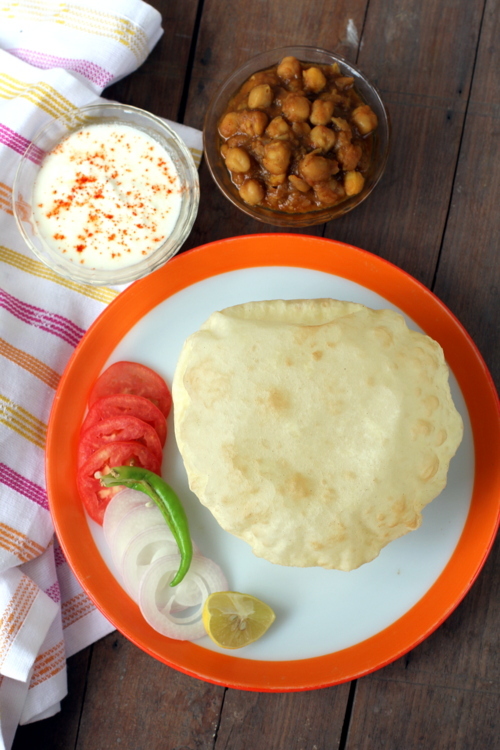 I have received several requests to post a perfectly light, fluffy bhatura recipe. I have already posted one and I have since tried to perfect the recipe of bhatura. It is almost close to what I have tasted at my Punjabi friend’s home many years ago. 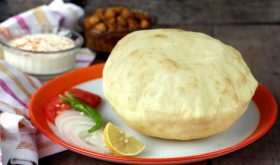 An indulgent street food fare, Bhatura is gem among Punjabi vegetarian recipes and is popular all over India. The sight of the puffed fried bread with an aromatic tangy flavored chickpea curry aka chole is hard to resist even to the diet conscious. 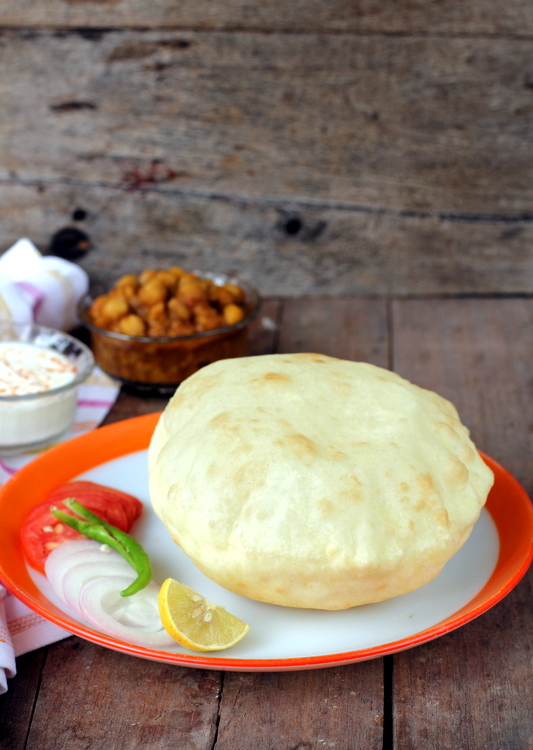 Bhatura has a crisp exterior and spongy interior with a mild sour flavor. An absolutely easy to make recipe that has no yeast in its making while yogurt and baking powder are essential. Serve bhatura with chole, sweetened yogurt/dahi that is lightly sprinkled with chaat masala, roasted cumin powder and red chili powder. Chole Bhature has all the essentials of a great brunch, its filling, decadent and makes for a complete meal. Combine all the mentioned ingredients (except oil for deep frying) and make a soft dough. The dough should not be too hard or too soft on touch. Cover with a wet cheesecloth and keep aside for at least 3 to 4 hrs. Pinch off some dough and make lemon sized balls and roll into thick round shaped rotis, approx 1/8â€³ thickness. It shold not be too thick or too thin. Heat enough oil for deep frying in a heavy bottomed vessel. Once the oil is hot, reduce flame to medium high, slide the batura into the hot oil. Using the back of the ladle, press in the center and along the edges and you will find it will puff. Flip over and fry the other side till light golden brown. The bature should cook on the inside and puff up. Remove on to absorbant paper. Serve hot with chole, sweet dahi with a sprinkle of chaat powder and chili powder, sliced fresh onions and salad of your choice. Ensure the oil is hot enough before frying the bhatura. If the oil is not hot enough you will find that the batura will absorb a lot of oil. Also ensure that the oil is not smoking hot as the moment you place the bhatura into the hot oil, it will turn dark instead of a golden shade. By Sailu Published: September 24, 2013 Recipe of bhatura is easy to make. An Indian breakfast dish and a gem among vegetarian Punjabi recipes. This Indian bread is served with chole & sweet dahi. So beautiful and perfect looking bhatura..
Wow! Such a simple recipe! I shall try it soon. Always wanted to try this, thanks for sharing. Made them tonight – they were awesome! Tried it .. just loved it. My favorite street food and I have never been able to get it right….except for now! Thank you so much for the recipe! Wish I could post a picture for you! You can keep it for 3 hours outside and then keep in the fridge overnight. Prepare bature in the morning. Bhatura May be we can says Halwa Puri with Chole This recipes My choice for Break Fast because majority of peoples Want to This BHATURA in Morning….after The seeing beutifull Dream 😀 Thank you for this recipe..
Wow….my bhaturas in last 6 years of cooking have never been better……thanks for perfect recipe…. Tried it and it came out very well. 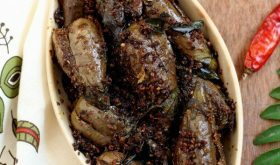 Thanks for this mouth watering recipe. Is it possible to freeze bhatura if so how to un freeze? You can freeze the dough by wrapping in plastic wrap and place it in a box in the freezer. When you want to make baturas, bring the dough out of the fridge, remove the plastic wrapped dough from box and place on kitchen counter. Wait for an hour or two and unwrap and knead for 3 mins or so and once it is pliable, roll out.